Been diving in Caribbeans? Please Vote! The Caribbeans comprises an area with over 32 countries. The area boasts easy accessible and superb dive locations. A popular vacation destination for both Americans as well as Europeans, this balmy part of the world offers all the diver could dream of. 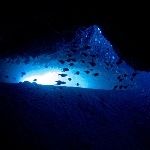 The Caribbean Sea has become one of the most established scuba diving destination in the world. This is due in part to the easy access by the worlds largest diving population, the united states. The caribbean is also a premier diving destination due to the vast amount varied and fabulous scuba diving that is on offer in one relatively compact area. Diving destinations are already well developed in the caribbean and we have broken the area into the separate sections for convenience. Each separate diving destination section has a brief overview along with more detailed information, dive sites and reviews. This dive site is the deeper one where it’s possible to dive with stingrays. Cueva Taina is one of Dominican Republic’s best cave diving with various tunnels and passageways. Cristal clear waters featuring swarming caribbean reef sharks. The Great Blue Hole off the coast of Belize is one of the most unique dive spot in the world. The Soviet Destroyer, Capt. M.V. Tibbetts, off Cayman Brac. This schooner measures greater than 100 feet and offers amazing, customizable liveaboard tours around the Bahamas all throughout the year. I’m Molly 😊, and I am a certified PADI Divemaster. I was having a look at the Sea Wolf Diving School website today, and Montserrat looks like a great place to dive! I am currently looking for work as a DM, so I am just dropping you a line with some details about myself my experience. I have recently been qualified at a marine conservation organisation in Malaysian Borneo, TRACC. Having spent the last three months there, I have trained and utilised the skills I acquired during my course in guiding certified divers and assisting instructors in their courses, while being involved in hands on conservation work with people from all over the world. Diving with strong currents regularly has improved my ability to think on my feet and asserting control of a group while communicating clearly underwater. Leading groups of less experienced individuals has also increased my ability to recognise problems before they become major issues during dives. I am comfortable giving constructive feedback post-dive to those that may need it, in a sensitive and professional manner, and welcome discussion about any challenges faced during the experience. I am looking to develop my career as a Divemaster and I also plan to pursue my DSD Leader and IDC in the future. The diving in Montserrat looks really special, so the chance to apply my knowledge of fish and marine invertebrates while introducing people to local dive sites would be an invaluable opportunity. Also, I have my own SCUBA gear and have DAN professional liability insurance. I was unable to attach my resume using this method of contact, however if there are any questions you have regarding my experience please don’t hesitate to get in touch – I can fill you in on anything I may have missed and forward you my resume via e-mail. Additionally, I have references, both character and professional, that can be submitted upon request. I am currently residing within the UK (Scotland), but I am ready to relocate at short notice if an opportunity with Sea Wolf Dive School was to arise.